This month I am stepping out with my dark chocolate mousse madness! I have tried nearly every basic chocolate mousse recipe (I still have one more up my sleeve) and now I’m going to use what I’ve learned to incorporate dark chocolate mousse into some more desserts —- All Vegan and No Sugar. To start off, I’m going to take July’s avocado-based mousse and change it up a bit. That mousse was very good but not very sweet and though I did put it into a pie crust, it really begged for a sweeter, more complex crust so here it is! This crust could be done with just ground nuts and dried fruit plus the cinnamon and seasonings. A mixture like that can be put into a food processor and then pressed into the pie plate to make a no-bake pie crust. Pulse the nuts in your food processor until they are finely ground up but not so much that they turn into a nut butter. Add the dried raisins next. Any dried fruit could be used here. Pulse the raisins or bits of other dried fruit with the stevia, salt and cinnamon and when it glops up, stop. Pour this glop into a bowl and add the almond flour. Blend the almond milk and the shredded coconut together and mix that in also. Once the mixture is pressed into place in the pie plate, bake it at 350 degrees for about 15 minutes to get excess moisture out of the crust. When done, the hot crust will not be totally hard or crispy. This method yields a different texture of crust that is slightly chewy. Cool the crust completely on a rack if you have one. You want to cool the crust without putting it into the refrigerator. Put everything into a food processor or blender and puree it until it is thick and smooth. What you may run into with this is that the cacao powder makes the mixture very thick and possibly too dense to blend it well. That is why you’ll want some coconut milk or other non-dairy liquid to loosen the mousse up enough to blend it. I probably added about 1/4 cup—a little at a time—but I don’t measure. I also used a spatula to help keep the mixture moving in the processor. Pour the mousse into the pie crust and spread it evenly. Lick the spatula and sprinkle some extra coconut flakes on top of the pie. This version of the avocado-based mousse was a little sweeter than the last because of the banana and the combination of the crust with the mousse was much more satisfying than the one I made in July! 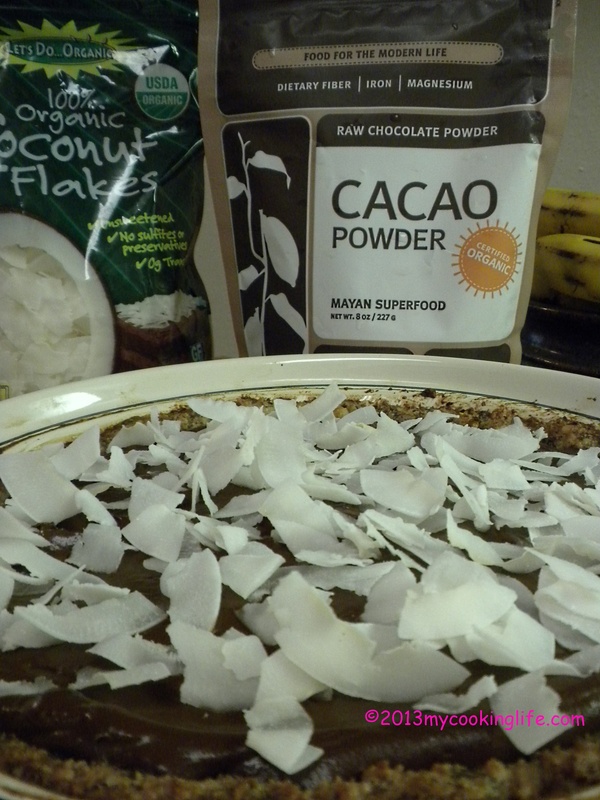 This entry was posted in Chocolate, Mousse, Recipes, Vegan and tagged Cacao, Chocolate Mousse, coconut flakes, Mayan super food, sugar-free dessert, vegan dessert by mycookinglifebypatty. Bookmark the permalink. Mmmmm, a dream recipe! I love that you’re vegan and I love that you write this blog. Truly. Kathy you are a true friend, thank you. The pie was good but oh so rich! Thanks! Avocado makes an incredibly rich and creamy mousse. I can imagine it would be very creamy. That might be pretty hard to do! I should come there and make it for you! Or, if you twp come here I’ll definitely cook up a storm for you.